This church is dedicated to a little known Anglo-Saxon saint, the 7th-century Northumbrian abbess, Ebba of Coldingham. The nave and south doorway were Norman-era features, while the lower level of the church tower was built in the 13th century. 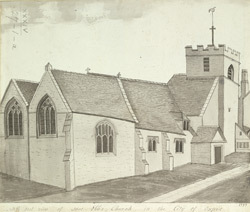 Substantial additions to the church were made between 1814 and 1817 by William Fisher.